Rear fender mount. Two styles, '80-81 Special at the top, Standards and '79 Special at the bottom. Completely different, this prevents swapping rear fenders between the two versions. The accessory mounting holes are also located slightly different (see arrows), so luggage rack and sissy bar interchange is affected; all standards and the '79 Special can swap bars/rack, but the later Specials need units designed specifically for them unless you mod them. Note that this late Special frame has been modified at the turn signal hole, normally this would look the same as the standard. This is the back-breaker; different mounting points for the muffler/rear footpeg supports, as well as a different brake linkage design; standard frame at the top. 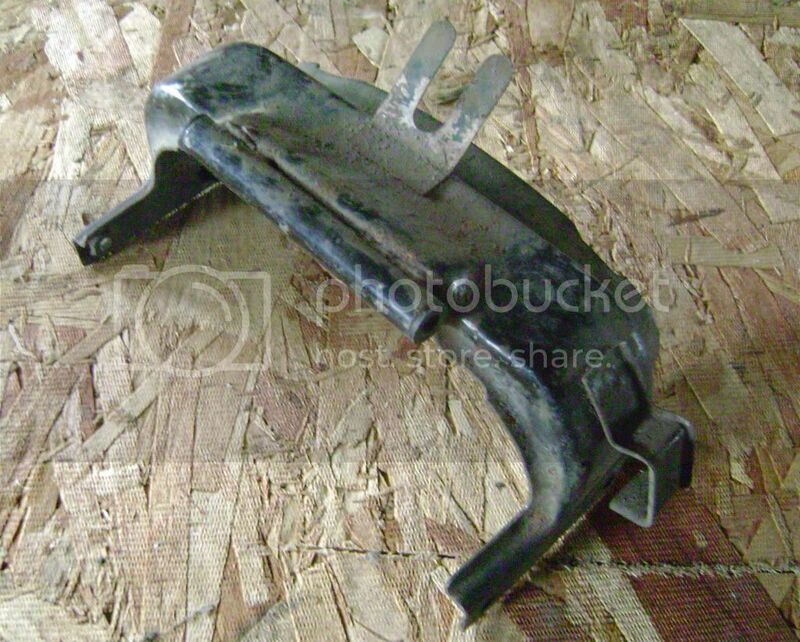 The arrowed holes are not in the same place, and the Special frame has the brake pedal pivot, where the standard has that as part of the muffler support. 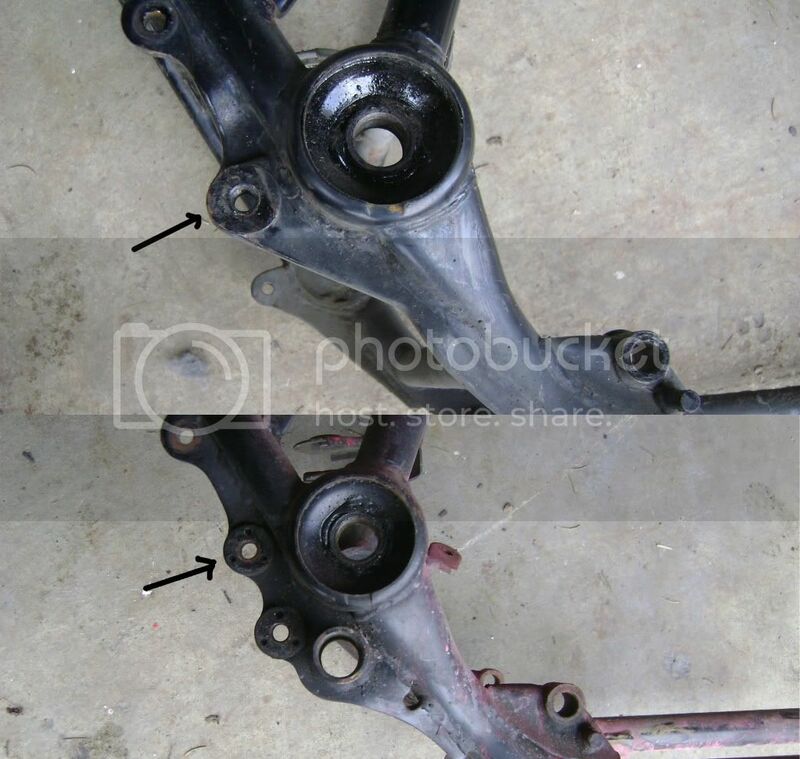 The supports/linkage will not interchange between these frames. '78-79 standard. The only two identical multi-year frames; these can be exchanged with virtually no issues. 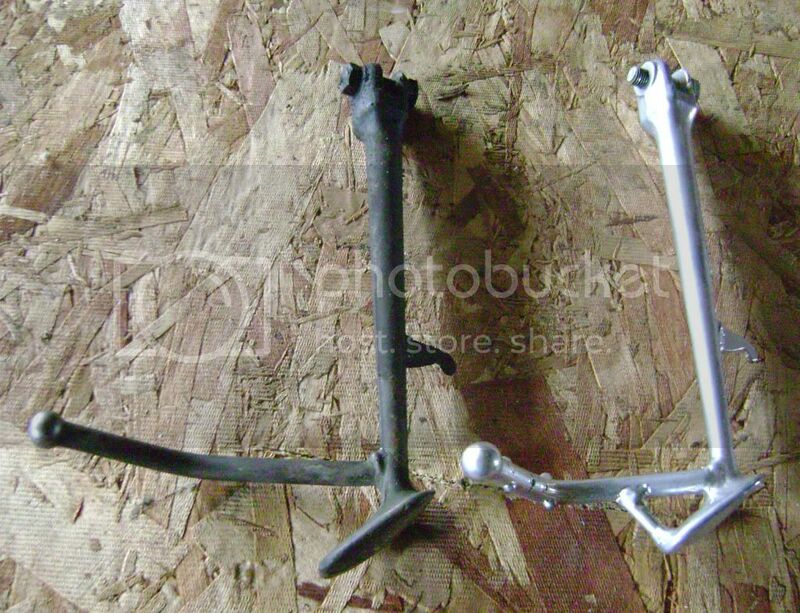 Includes brackets for storing the 'emergency kick lever', and has a single horn mount. Side cover mounts only accept matching year/model covers. Will have 2H7 stamped on the neck. '79 special. One year only. Has the kick lever brackets and single horn mount. Side cover mounts accept '79 special cover only on left side, '79 special and '80-81 standard cover on right. Very similar to the '81 standard frame. 3H3 stamp. '80 standard. One year only. Kick lever brackets are now gone, horn bracket is changed for dual horns. Two additional electrical brackets, one for the relocated main fuse and one for the 4-way flasher. Side cover mounts accept '80-81 standard covers, '79 special cover on right side only. 3H5 stamp. '80 special/Midnight Special. One year only. Same changes as the '80 standard, but side cover mounts only accept '80-81 special sidecovers and now has mounts for front reflectors. These two models have different stamps as the MNS frame featured better 'finish' compared to the 'plain' special so look for 3J6 on the special frame and 4H3 on the MNS frame. These are otherwise the same. '81 standard. One year only. Basically the same as the '80 standard with two minor and one major difference; the minor items are additional brackets for a 'locking cable' box and the deletion of the ballast resistor bracket. The major change is the standard is now using the special exhaust, so the muffler/footpeg supports and brake linkage is now the same as the special. This frame will interchange with the '79 Special frame, but will not have all the same brackets. 4R1 stamp. '81 special. One year only. Same as '80 special frame except for deletion of ballast resistor bracket. 4R0 stamp. '81 Midnight Special. One year only. Same as '81 special except for additional brackets for locking cable box and linked brakes, better finish. 4W1 stamp. There is interchanges possible in the '80-81 special frames as long as certain brackets aren't needed or you're willing to make the needed mods. But for direct one-for-one interchange, this is it. 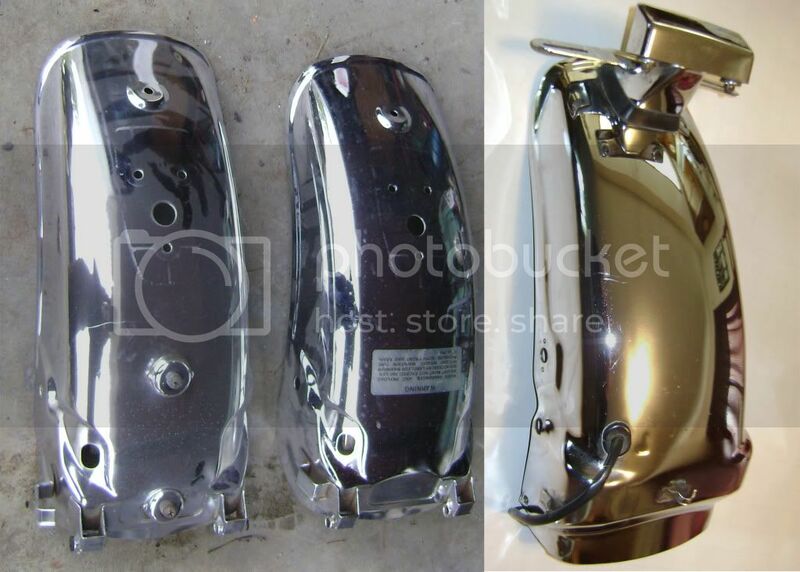 The top pic is 3 of the 4 fender types. These are (left to right) '78-79 Standard, '80-81 standard, and '80-81 special; not shown is the '79 special. The rear fenders follow the frame, so you have the two basic types, standard/79 special and '80-81 special. 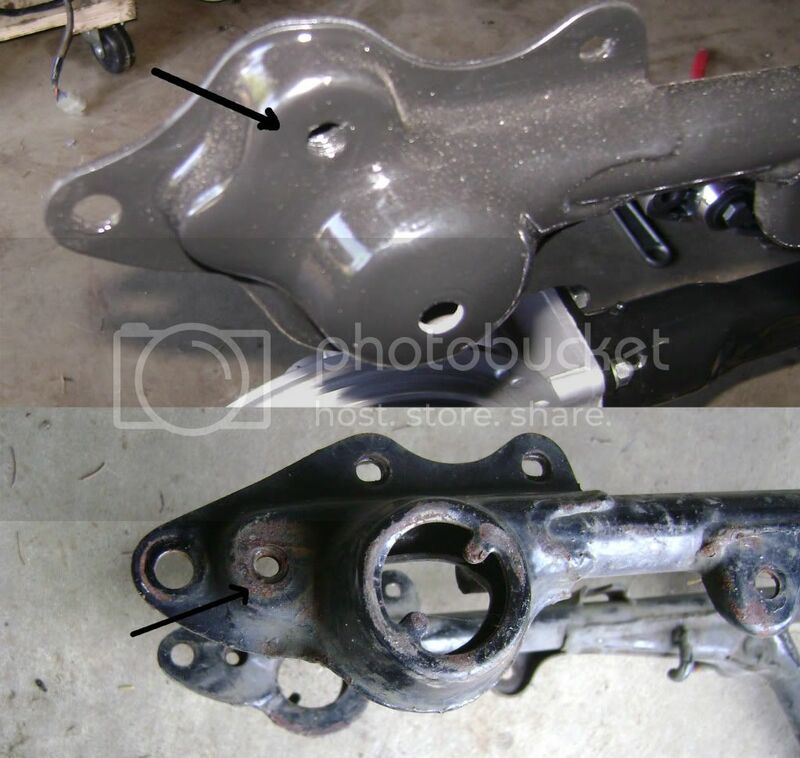 The major difference is the standard fenders are hinged for tire removal; the lower pic is of the standard frame mount/hinge. There's two variations of each type; the '78-79 and the '80-81 in the standards, with the only differences being the early fender has mounts for the TCI unit and the bolt holes to the frame are threaded; the later fenders use a nut. The special has the '79-only rear fender, and the '80-81. The '79 unit is similar to the one shown (will only fit the '79 Special frame; will also fit any standard frame) except set-up for a taillight mount similar to the standard so will have holes like the standard fenders shown, the late units as shown only have have a license plate mount/light as the taillight mounts to the cast aluminum grab bar. Fully interchangable in the XS bikes across all years/models. The XJ tray is XJ-only and on the right in the pic. These follow the type of exhaust fitted, so the '78-80 standards use their own side/center stands, the specials, '81H and XJ all share the same units. The standard model stands won't fully retract with the special exhaust as they'll hit the muffler first. Standard centerstand on top, Special/'81H/XJ on the bottom. 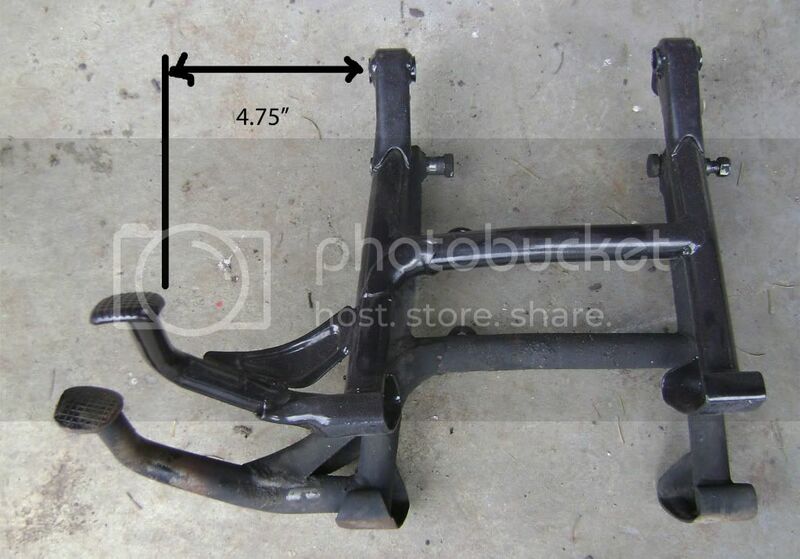 Both are the same height and mount to the frame the same, difference is the 'foot' arm. 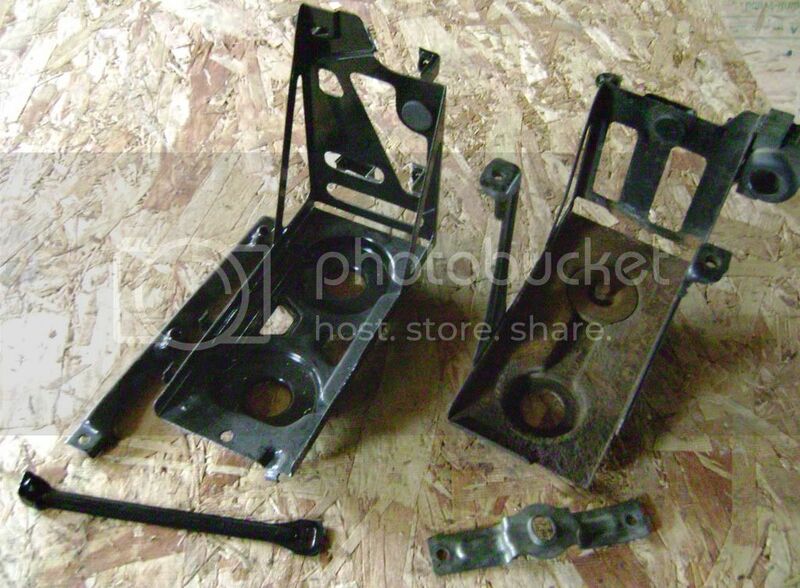 Distance from the frame mounting bracket to the inside of the pedal is 4.75" for the standard, 6.25" for the Special. Check this if your bike is fitted with a non-stock exhaust to see if you have enough clearance. For you restorers, the XJ stand has one minor difference; the foot pedal is a flat stamping, not the rounded one as used on the XS stands. Sidestands, same difference. Height is the same, longer 'arm' on the Special/H/XJ units. Last edited by crazy steve; 06-07-2012 at 11:11 PM.